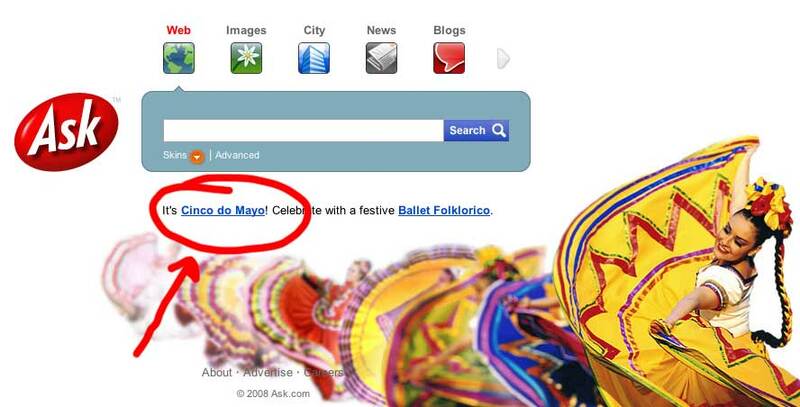 Ok, so Ask.com didn’t really ruin Cinco de Mayo, but they ruined the spelling of it. On their homepage, they’ve misspelled the Mexican holiday as Cinco do Mayo. Only one letter off but that’s enough to have people like me out there putting up blog posts about it. Maybe Ask.com should do this all the time, that way they can get more traffic. Really though, something on the home page of a search engine should be spell checked much more closely. Celebrate Earth Day, Search Community! I think it doesn’t matter. It just shows how much attention people pay to other cultures. “OK guys… It was an honest silly mistake after several revisions and validation on our part. One guy just decided to brave Spanish by re-typing versus copying and pasting (while perhaps having commenced the celebration way too early). Apologies on the “Cinco doh’ Mayo” boo boo… But, wasn’t the accompanying picture nice though? Unlike Google, we tried. In any case, more important matters have taken the center stage in our home page. Please use it to help the victims of the catastrophe in Myanmar.